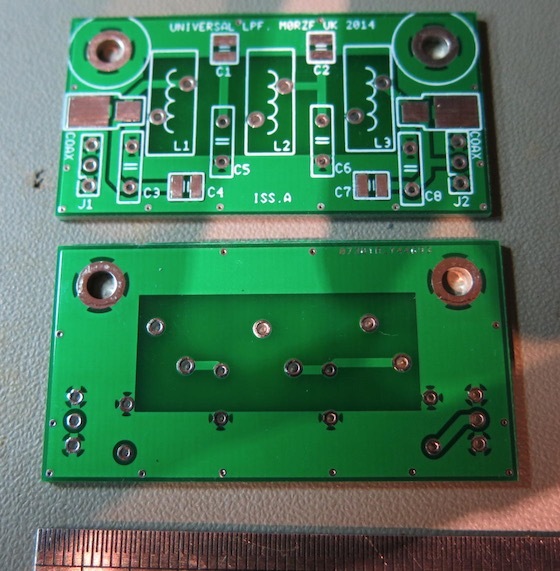 Previously I designed amplifiers to produce 15-20W of RF power from less than 0.5W of drive. Targeted at Soft-rock project builders, though adaptable to boost other QRP or home-brew rigs to the 15-20W level. I added several unique options. All details are in the public domain. Anyone that wishes to build this design, get commercial standard PCBs made, or sell kits, is welcome to do so. Datasheet parameters to look for in switching FETs are low input capacitance (<350pF), Vds max >40V. Package TO-220 or TO-247. Most MOSFETs optimise RDSon and have high input capacitance. Check websites of ST, Fairchild, NXP, Texas Instruments, On Semiconductor, International Rectifier, Vishay, and others. New types of MOSFETs often come onto the market. The Kits & Parts single band filter is no longer available. I have some replacements. 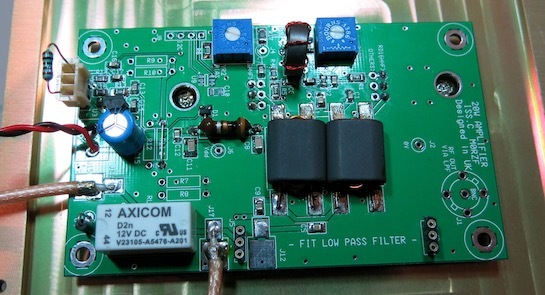 There are several options for external filter banks on the amplifier PCB. An external higher power amplifier can also be used. Look at the circuit diagram and see what is possible. That’s why there are several coaxial termination pads on the board. Anyone that builds this amplifier, then wants to cover more bands with automatic switching, can add an external board. If there is demand I can design a suitable filter bank. My previous design had 4 filter banks, and worked fine from 80m-15m. If you want better efficiency on the bands <10MHz it is possible to use a BN43-202 twin hole ferrite rather than the type 61 ferrite. Also there’s an option for a TMP100 temperature sensor, controlled by I2C. MoBo V4.3 users may find it useful to read the output PA temperature instead of the MoBo PA which becomes the driver stage. NOTE THAT THE BOM HAS BEEN UPDATED TO CORRECT ERRORS AND ONLY LIST PARTS THAT FARNELL/MOUSER HAVE IN STOCK. Gerber-X files (issue C) are found here. Have a look at them with a free Gerber viewer like PentaLogix SmartDFM. I included top and bottom silkscreen, but to save costs the bottom silkscreen is not essential. Board size is 100 x 60mm. Recommended PCB type is 1.6mm thick FR4, plated through holes, hot air solder level (HASL) finish, 1oz copper. Top and bottom solder masks are required. Any PCB manufacturer who has a clue will accept those files. The circuit diagram is here, the bill of materials (BOM) is here. NOTE: THE FOOTPRINT OF U2 (78L05) IS REVERSED ON ISS.C BOARDS, and CORRECT ON ISS.C1 BOARDS. The concept was based on the transformer layout by G6ALU which is functionally equal to other transformer layouts, and uses easily available BNxx-202 twin hole balun cores. I made a first attempt with the issue A board, superseded by the issue B which was sold as a kit. It had many features to interface with Softrock RxTx V6.3 and the Ensemble boards with a few component values different. The power output was near 20W on the lower bands, dropping to 15W on 28MHz. On my PCB the positions for RD16HHF1 connections are indicated on the silkscreen layer if using a commercial standard PCB. The drain and source pins are reversed between the Mitsubishi FETs and switching types. When using Mitsubishi FETs, performance is equal to other amplifiers, such as PennyWhistle from HPSDR. The original page for the Pic-A-Star amplifier is still available here. The Mitsubishi FETs are very robust devices. 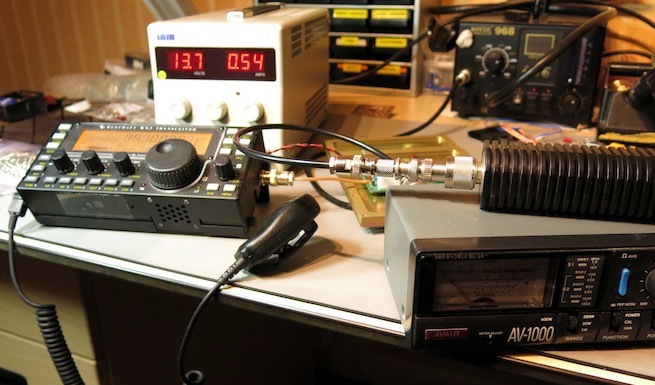 The RD15HVF1 from Mitsubishi is also suitable, and gives slightly better gain at 50MHz. Switching FETs are much cheaper, but how is their performance compared to the “RF” parts? A major physical problem with switching FETs is the tab is drain. So tab is “hot” in voltage and RF terms, but has to be heat-sinked. I recommend a relatively thick heat transfer washer without heat transfer compound. 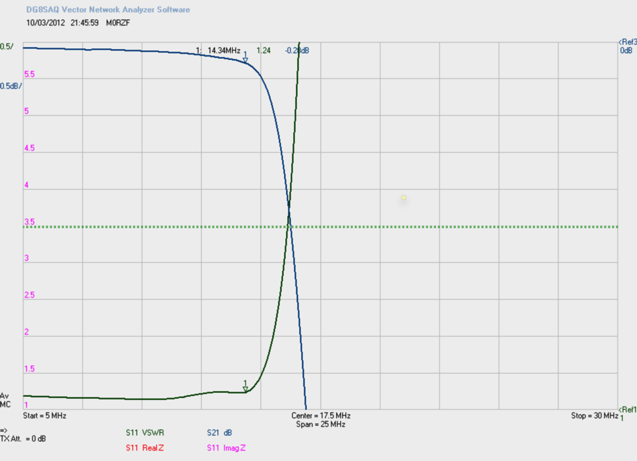 Before fitting the bias network resistors, check the VGS threshold of your devices. Resistors at top and bottom of the trimpots VR1, VR2 are there to make adjustment easier. So calculate the centre point of VR1, VR2 to be at the point where the device just switches on. Unfortunately switching FETs are designed with a very sharp DC switch-on point, as required in power supplies. This can make the bias unstable. I found the STP16NF06L to be very sensitive to adjust. Despite temperature compensation they will run-away and overheat. Always watch the current drawn by the circuit with a multimeter when adjusting, and observe the variation over several minutes. 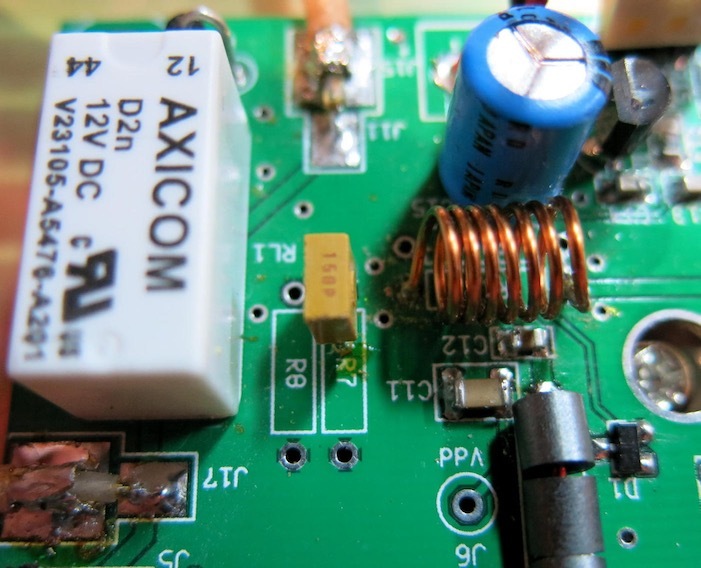 With the TE Axicom relay, quiescent current is 80mA at 13.6V. It is safe to put 200mA quiescent through each MOSFET when heat-sinked. The input SWR and of course the gain is affected by the bias current. Before running power tests, I looked at the response of the Kits & Parts 20m band low pass filter in-situ as in the picture. The first plot shows SWR and S21 (thru) response with the 20m filter plugged in. The second plot is the input with resistors added to bring up the impedance closer to 50 ohms. It is possible to experiment with the input PI network and achieve better matching, though the input SWR is reasonable and will not be a problem for most driving stages. Certainly the Softrock output stage can drive this without problems. 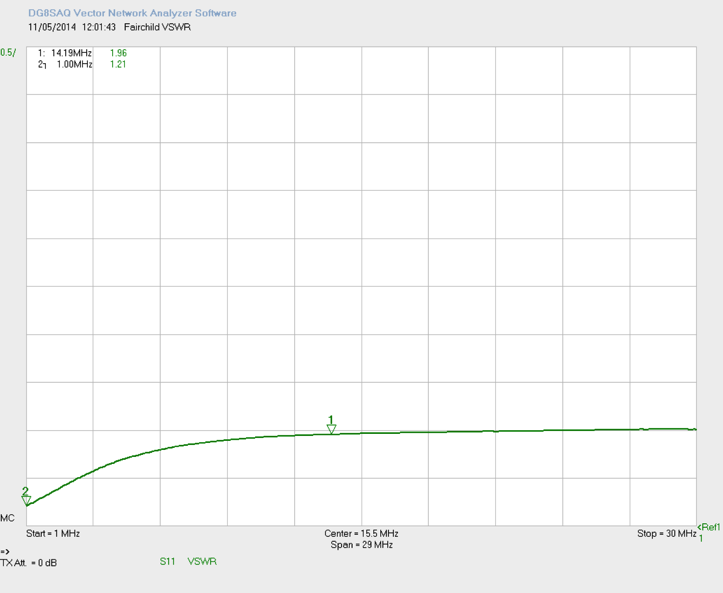 It is worth noting the high SWR on the right of the plot is caused by the low pass filter response, as expected. The big question is how good is linearity of these FETs in two tone intermodulation? Running into a dummy load with PSK-125 and listening to the signal on a receiver, while varying the power gives a rough idea. The signal sounds the same from power outputs of a few watts up to 25W at 14.070MHz. There is also no detectable splatter with the receiver. My test equipment does not run to a spectrum analyser. I only have the SDR-Kits VNWA network analyser, which is brilliant at its primary function, but the spectrum analyser has a minimum resolution of 250Hz. I also have no proper signal generator, let alone the two required for an intermodulation test. The best I can do is generate a PSK-125 signal and sniff the output on the VNWA used in spectrum analyser mode. Overall gain with STP16NF06L is actually higher than RD16HHF1 on the lower bands. If you only want to operate <10MHz they would be better. But see the compensation notes further down this page. In a PSK-125 intermodulation test, this is the result from the RD16HHF1 amplifier driven to 16W (post filter) on 21.070MHz. Two tones with no characters transmitted during analyser sweep. 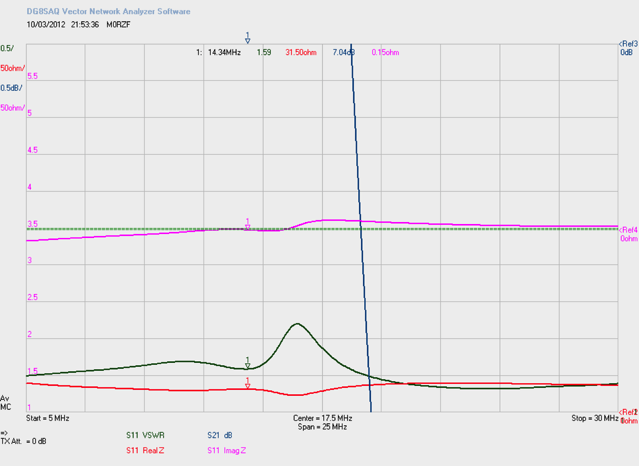 Next the result of the STP16NF06 at same power level. 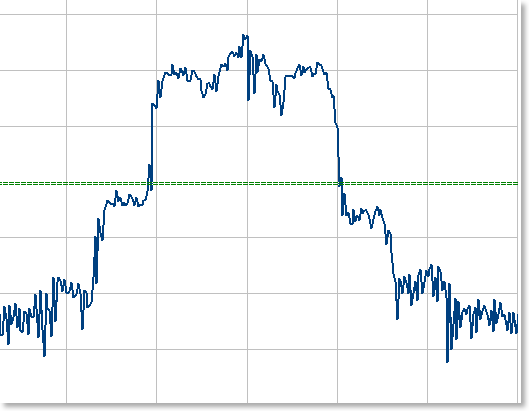 The “shoulders” relative to the main signal are lower than the RD16HHF1 result. The “shoulder” is about -22dB and -25dB respectively, representing intermodulation products from the amplifier. The input power at 250mW is well within the Softrock Ensemble PA linear region. Driving either type to an output of 25W makes the “shoulders” rise up towards the main signals, to within -10dB. This expected result shows the test is a valid one. Surprisingly the cheaper MOSFET has a better intermodulation performance than the expensive “RF” part. The Mitsubishi RD16 die is probably a standard FET die wire bonded differently to get the tab grounded. There is no magic in its construction. A 150pF leaded capacitor at the R7 position. There is a grounded via provided in the middle of the R7 position to fit one leg of the capacitor into. A 180nH air spaced inductor at the R1 position. 180nH can be made from 7-8 turns of 22SWG wire wound on a 6mm former. A picture of the frequency compensation circuit follows. It is best to start out with 8 turns and adjust the power output on 29MHz. If you find spacing the turns right out increases power, then desolder the coil and remove a turn. 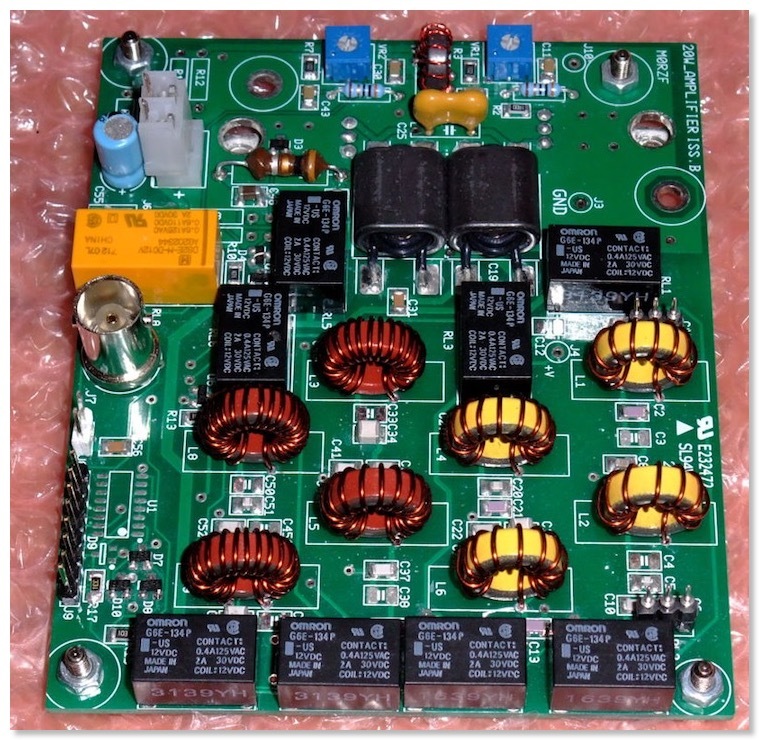 Gate capacitance varies widely on these FETs, it is best to adjust your own board individually. Also check the gain on 21MHz is peaked up. With the compensation network, I find the maximum power output to be 25W on 29MHz, with 1.0W input. At 3.5MHz it gives 30W for 0.5W input. In conclusion, I find the STP16NF06 to be a capable and cheap amplifier device for HF transmitting. The FQP13N10L is on paper the lowest gate charge TO220 device available. They are often found in the PA stages of 27MHz CBs. Some of the previous notes are still valid for winding the transformers and setting up. The original builder’s notes file (PDF) is available here. The STP16NF06 or switching FET version only differs in the DC bias (gate) voltage needs to be set lower than the RD16HHF1 version. The Softrock Ensemble should be arranged to switch the amplifier to transmit by connecting the /PTT line (U4 pin 4) to the J9 pin 1 of the amplifier. So pulling down the base of U3 on the amplifier when the Tx is keyed. Coax input at J11 can be connected straight from the Ensemble RF output. Details of how to terminate coax tails is in builders notes. My previous project was an amplifier with integrated filters, circuit diagram here. 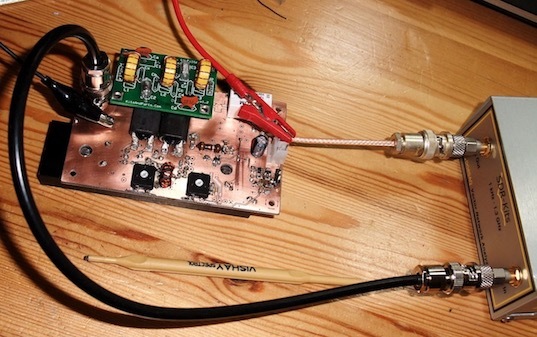 Design of HF amplifiers using Mitsubishi RD16HHF1 MOSFETs is old news now. The ones I built in early 2009 are still working reliably. This was the last “issue.B” unit, all of which are now sold !